It’s vacation season! That’s right, Memorial Day weekend is fast approaching and will mark the start of summer, the season known for vacations! Ready for that beach trip? The 2017 Toyota Tacoma is the vehicle for you! That’s right, the 2017 Toyota Tacoma at Mount Airy Toyota is ready to hit the road! 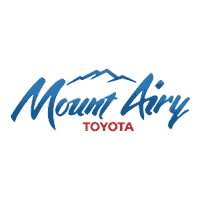 Trucks are the vehicles to drive this summer and this Memorial Day weekend Mount Airy Toyota is having unbelievable sales to ring in the season. Memorial Day has been a long celebrated federal holiday to commemorate those who have fought, and currently fight, for our country. Mount Airy Toyota supports those who serve, and those who have served. We would like to show our gratitude and appreciation this Memorial Day weekend by proudly offering outstanding military discounts! Memorial Day was previously known as Decoration Day. The holiday began following the Civil War and then later began a federal holiday in 1971. History.com says, “By the late 1860s, Americans in various towns and cities had begun holding springtime tributes to these countless fallen soldiers, decorating their graves with flowers and reciting prayers.” From here, Memorial Day slowly evolved into the holiday it is today, originating in New York in 1966. No matter how you choose to celebrate the holiday, make the most of it in a new truck! Trucks are the number one summer vehicles. They are bold and adventurous and great for exploring the outdoors. Summer vacations are better in a vehicle where packing is easy and hauling boats and equipment is fun. Memorial Day Sales are here and the 2017 Toyota Tacoma is on special. Mount Airy Toyota is promoting the 2017 Toyota Tacoma with a leasing value of $318 a month. Shape- The Tacoma has a bold and chiseled character that is shaped differently than most trucks. The design is aggressive and shows muscular fenders and intensifies the vehicle’s strength. Front Grille- Every vehicle is partly defined by its look, and the front grille can make or break it. With the aggressive and bold grille on the Tacoma, viewers are sure to be drawn to the vehicle. LED DRL Projector-Beam Headlights- See and be seen with these outstanding lights. These lights are LIT, with extra safety and style. Embossed Tailgate- The tailgate has a wild style with the Tacoma logo boldly placed on the rear gate. This bold design feature shows who’s the boss. Soft-Touch Materials- The interior seating is soft, comfortable, and elegant. The seats also come in leather-trim surfaces in the Tacoma Limited. Quiet Space- Car rides are for quiet time and conversations. The Tacoma is designed to keep outside noise to a minimum to give you a peaceful riding experience. The cab-to-bed seal and aerodynamic performance greatly help block out wind noise. Dual Zone Climate- No matter what the weather is, stay comfortable with whichever temperature you prefer. Available Moonroof- See the sun, stars, or moon from the comfort of your vehicle. Off-Roading, vacation-getter vehicles are all about capability and performance. They’re great for rocky roads and sandy beaches, or for towing boats or hauling four-wheelers. The Toyota Tacoma can handle it all with a handful of key features. Dan Edmunds rates the off-road for the Tacoma with five stars, saying, “All 4×4 versions of the Tacoma do very well, but the TRD Off-Road has the suspension, tires and abundant clearance to go places other pickups, including other volume-selling midsize truck models, cannot. The locking differential, terrain select and crawl control systems are real advantages.” When driving across difficult terrain and off-roading, the vehicle automatically adjusts the throttle and brakes on five low-speed settings to help the vehicle move with ease! Multi-Terrain Select allows you to switch between five different modes. These modes help regulate wheel spin and adjust the engine throttle and traction control. Conquer hills with confidence! Hill Start Assist Control helps minimize the vehicle rolling backward when shifting from the brake to gas. Electronically Locking Rear Differential helps you move through terrain that other vehicles can’t. Engine power is distributed evenly to both rear wheels so all wheels will move at the same speed. This helps provide grip for low-traction terrains. With Electronic Shift Transfer Case, you can easily change between high-range 4WD, low-range WD, or high-range 2WD with a quick turn of a knob. High-Strength Steel- It’s stronger and lighter than regular steel and its toughness keeps the performance top-notch while helping keep passengers safe. The Engine- This truck has a 3.5-liter V6 direct-injection engine for excellent performance. 6-Speed AT/MT- The Toyota Tacoma uses two transmissions to provide top performance and solid fuel efficiency. 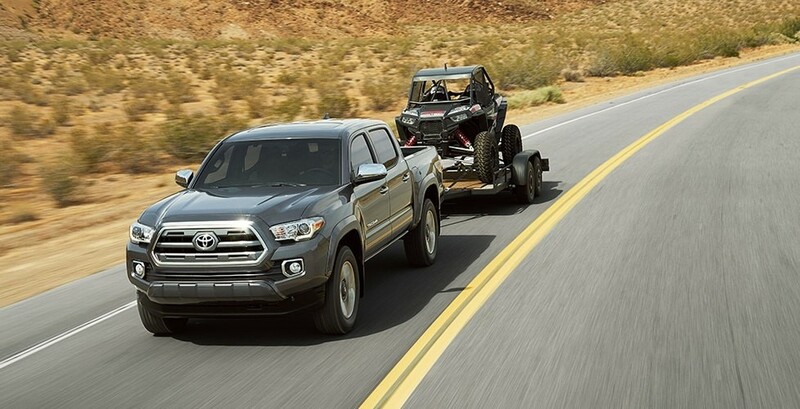 Towing- The Tacoma is perfect for all your towing needs. Whether you have jet skis, four-wheelers, or trailers, this truck has you covered with the ability to tow 6,800 pounds and carry a payload of up 1440 pounds! Trailer-Sway Control- When the wind gets rough or weight shifts in your trailer, Trailer-Sway Control will keep it in position. Brakes are applied to the wheels and the engine torque is controlled to keep your trailer in line. Smart Key- Open your truck hands-free with the keyless entry smart key. You can also start the engine with just a touch of a button. GoPro Mount- Capture your off-roading experience from the driver’s perspective. There is a GoPro mount that comes standard on the windshield. Qi-Compatible Wireless Charging- Cables and wires are a mess. So, forget about them! The Tacoma has wireless charging for phone, using a nonslip surface. Composite bed w/120V outlet- Keep the party going by hooking up radios and speakers to the 120V/400W outlet in the bed of the truck! Door Structure- Safety first! Keep everyone in the vehicle safe with the high-strength steel used in all the doors. Toyota this Memorial Day and take a spin in the 2017 Toyota Tacoma! Lease this truck for only $318 a month. Call (336) 786-2118 to learn more about the specials on the 2017 Toyota Tacoma!